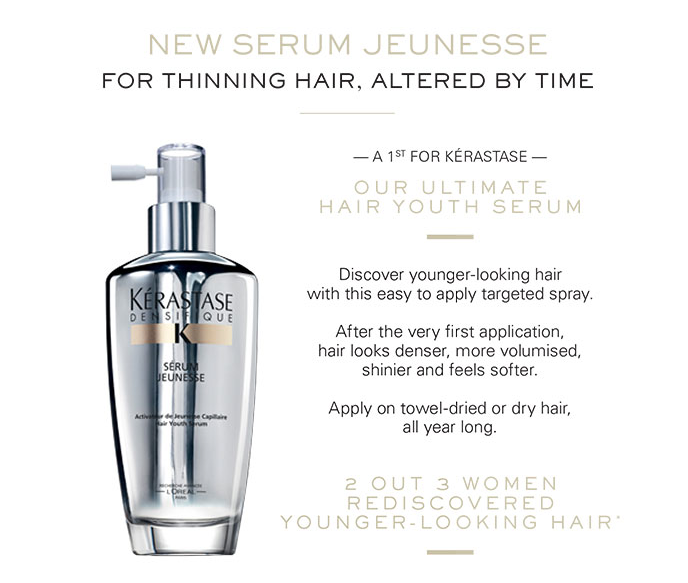 Within their range Densifique, Kérastase launched the hair youth serum “Sérum Jeunesse”, a product for ageing hair to compensate the loss of quality due to greying process. After the hair care market saw a lot of anti-age shampoo launches in the past years, Kérastase now goes one step further by launching a youth activator serum for greying hair. The branding – including packaging, naming and usage – is inspired by high-class anti-aging face serums (e.g. Lancôme Genifique). It has to be massaged into the scalp and can be applied in the length of the hair.